This IBM® Redbooks® publication describes IBM DB2® SQL compatibility features. The latest version of DB2 includes extensive native support for the PL/SQL procedural language, new data types, scalar functions, improved concurrency, built-in packages, OCI, SQL*Plus, and more. These features can help with developing applications that run on both DB2 and Oracle and can help simplify the process of moving from Oracle to DB2. In addition, IBM now provides tools to simplify the enablement process, such as the highly scalable IBM Data Movement Tool for moving schema and data into DB2, and an Editor and Profiler for PL/SQL provided by the IBM Data Studio tool suite. This Oracle to DB2 migration guide describes new technology, preferred practices for moving to DB2, and common scenarios that can help you as you move from Oracle to DB2. This book is intended for IT architects and developers who are converting from Oracle to DB2. 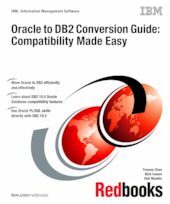 DB2 compatibility with Oracle is provided through native support. The new capabilities in DB2 that provide compatibility are implemented at the lowest and most intimate levels of the database kernel, as though they were originally engineered for DB2. means that the DB2 implementation is done without the aid of an emulation layer. This intimacy leads to the scalable implementation that DB2 offers, providing identical performance between DB2 compatibility features and DB2 other language elements. For example, DB2 runs SQL PL at the same performance as PL/SQL implementations of the same function.